Road warriors. That's the best way to describe these Chippewa Men's 27950 Black 17 Inch Polished Trooper Leather Boots. Rugged, functional, and seriously handsome, this pair is sure to make you the king of the road. This footwear was built with sleek black leath ... (see full details) (see specifications) #CHP27950. Road warriors. That's the best way to describe these Chippewa Men's 27950 Black 17 Inch Polished Trooper Leather Boots. Rugged, functional, and seriously handsome, this pair is sure to make you the king of the road. This footwear was built with sleek black leather uppers that have been waxed and oiled to make it water-resistant, and the uppers are polishable, so you can keep them looking great. The tall, 17-inch design of the men's boots features black, non-tarnishable hardware and upper padding for maximum comfort. Chippewa utilizes Goodyear Welt construction to attach the leather uppers to the rugged soles in this pair of black boots. Stitched rather than glued, Goodyear Welted footwear is not only reliably durable, but fully repairable for years of added wear. Vibram Alpha plus yellow plug outsoles deliver superior slip-resistant traction for you on a variety of surfaces. The soles are non-marking and oil-resistant as well. Fully lined on the insides with leather, these USA-made shoes are as comfortable as they are good-looking. Reinforced toe pads protect your toes and arches from fatigue, while soft insoles soften your step. Texon anti-microbial insoles fight odor-causing bacteria and move moisture away from your feet for a dry fit. Triple-ribbed steel shanks also help stability your arches, and so do the 4 iron rubber/6 iron robus combination midsoles in this premium footwear. Command the road in style and comfort. Slip into these Chippewa Men's 27950 Black 17 Inch Polished Leather Trooper American-Made Boots for your next ride. Just click on the cart to order, and we'll send them right to your door. Excellent boots feel like butter on your feet. Run true to size. I purchased a wide width because I was told they run a little narrow but that is not true. I use an insole to make up for the oversize rather then exchanging. We wear these boots year 'round in my unit both on the wheel and in a car. Some guys need the calf stretched and some guys need them trimmed. With some pro alterations and a couple days break in these boots feel great during a long day. Still cheaper then full custom boots and as long as you clean them up after your tour and take good care of them, you'll retire before they do! i believed this would fit our police uniform (motorcycle unit) here in our country (Philippines). 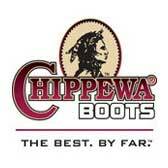 Chippewa Boots: Men's Black USA-Made Polished Leather 27950 Trooper Boots is being added to your cart.